Cheap Hotel Rooms in Glasgow - high quality, low prices! When visiting a city like Glasgow, most of us are looking for the most comfortable, most centrally located and the best value option when it comes to choosing our hotel accommodation. The Sandyford Hotel is a combination of all that is required in a 3* hotel, but with more than you would usually expect from cheap Glasgow hotels. Take our location, for starters: we are conveniently situated between the City Centre and the West End of Glasgow, on bustling Sauchiehall Street, which boasts a wealth of eateries and other forms of entertainment. It is a short walk from The Sandyford Hotel into the heart of Glasgow, so unlike some other cheap Glasgow hotels, you will not have to take a car or public transport unless you want to. The Sandyford Hotel is family-run and we don't believe in skimping when it comes to extending a warm, Scottish welcome to all our visitors. Our friendly staff members are available 24 hours a day to answer any questions you may have, recommend itineraries or places to visit and do everything to ensure that you get the most out of your stay in Glasgow. Our bed and breakfast prices may be cheap, but the quality of the service will leave you more than satisfied. 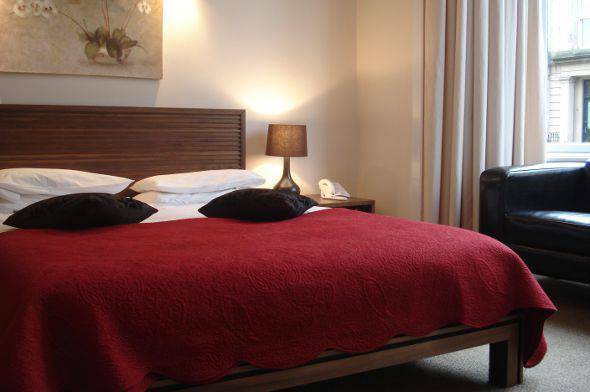 All 55 of our rooms are en suite and are tastefully furnished with a high standard of comfort. We understand that cheap does not mean cutting corners and the cleanliness of the hotel is a top priority for us. Our cheap and affordable B&B rates include a full Scottish breakfast, with bacon and eggs, sausages and mushrooms. Visitors can also choose a more continental-style breakfast, with juices, yoghurts and fresh croissants available each morning. Why not call The Sandyford Hotel today on (+44) 0141 334 0000 to find out about available Glasgow hotel rooms at cheap rates. We will be more than happy to answer your queries and find the best value for your stay. You can also make a booking enquiry through our website, with the help of the online booking form.